In the John Price Memorial Library we have a number of ongoing projects, one of these being the cataloguing of items to add to our collection. Recently I was asked to add a collection of drawings to the catalogue. 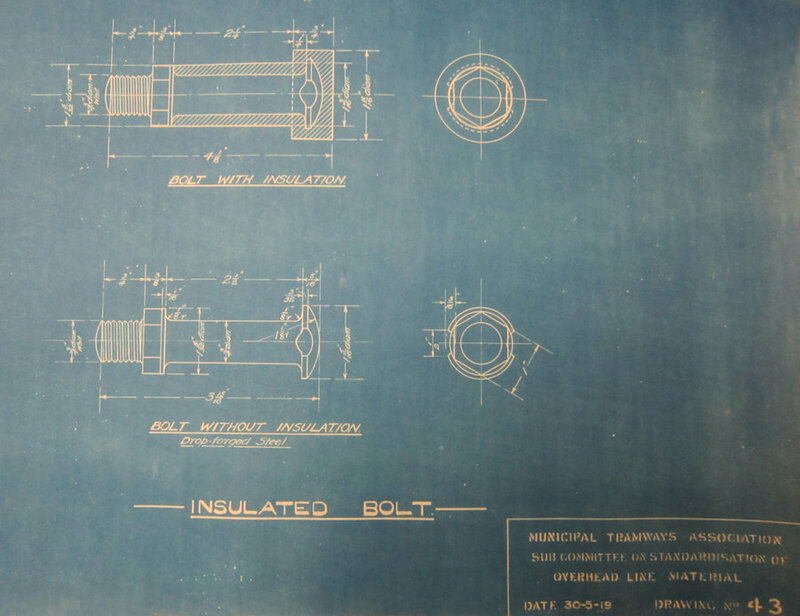 There proved to be 65 of them, all produced between 1918 and 1922 by the Municipal Tramways Association (MTA) Sub-Committee on Standardisation of Overhead Line Material. 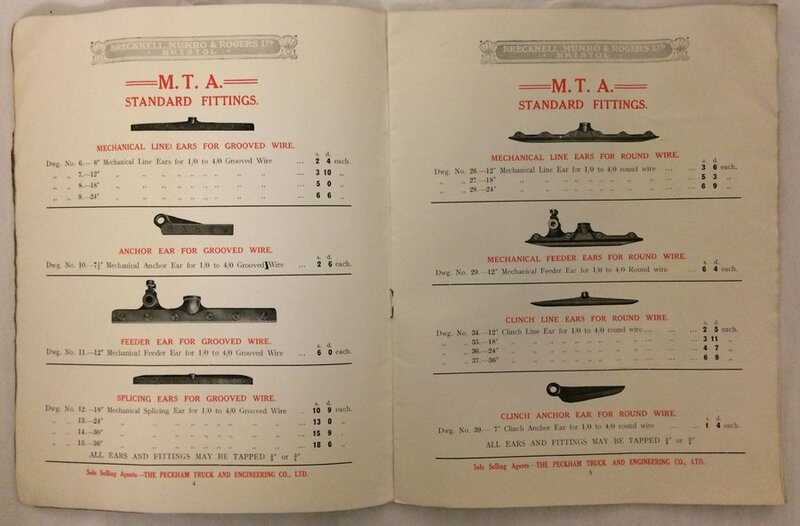 We had just been doing research for the ‘Arms to Armistice’ exhibition, which covers the latter years of the First World War and the immediate post-war period, and by a happy coincidence, the MTA’s Minute Book No. 4, covering the period September 1918 to July 1919, was still on our work table. Searching through the entries in the Minute Book we found several references to the Sub-Committee, including a letter from them dated 9th April 1919, stating ‘Drawings have now been prepared for a number of overhead line fittings which it is proposed to standardise, and in certain instances it has been thought necessary to make patterns, and specimens in order that practical tests can be made.’ Having discussed this letter the MTA listed the tramway undertakings which would be ‘invited’ to contribute to the cost of preparing the patterns and specimens! 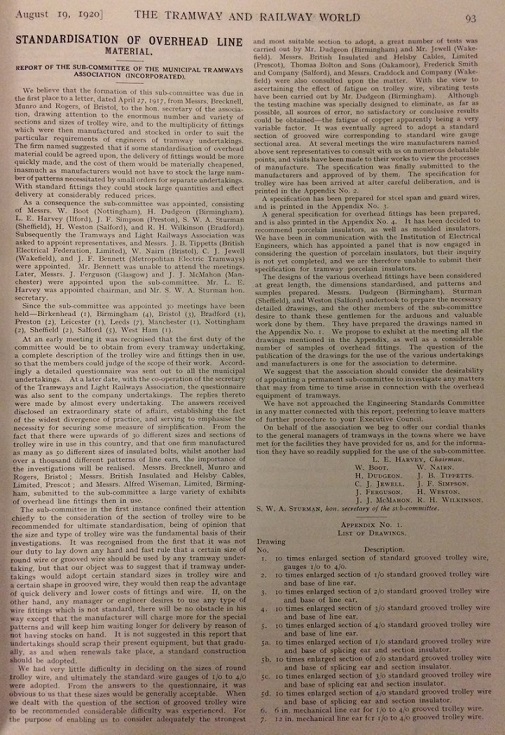 Further research revealed a copy of the Sub-Committee’s Report, which appeared in full in the issue of Tramway and railway World dated 19 August 1920. The report listed the drawings produced by the Sub-Committee up to that date. 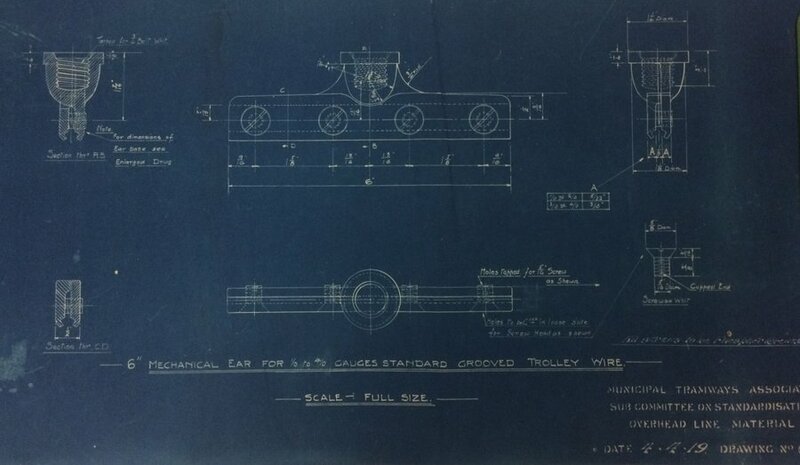 The list proved that we have the full set of drawings, together with three which were added later – one of them a Revision Sheet, showing certain improvements which had been made ‘after the experience of practical use’. The Report tells how, on 27 April 1917, the MTA received from Messrs. Brecknell, Munro and Rogers, precision engineering of Bristol, who pointed out that ‘if some standardisation of overhead material could be agreed upon, the delivery of fittings would be more quickly made, and the cost of them would be materially cheapened.’ The Sub-Committee was appointed to investigate. 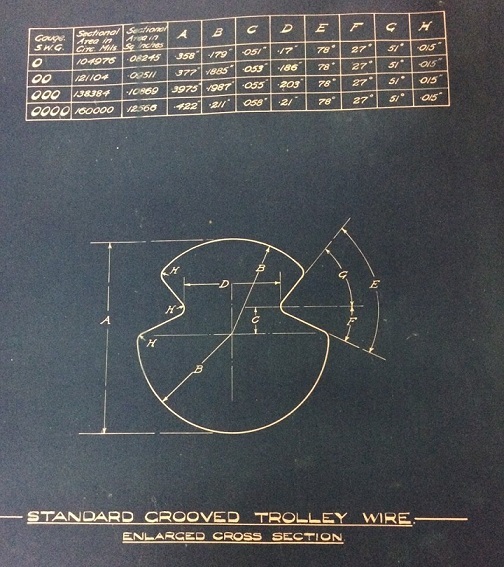 The Sub-Committee had first to decide which size and type of trolley wire would be adopted as standard. They did not, however, intend to ‘lay down any hard and fast rule that a certain size of … wire should be used by any tramway undertaking’ – tramway managers were free to use a non standard type, but of course they would have to wait longer and pay more for the components! 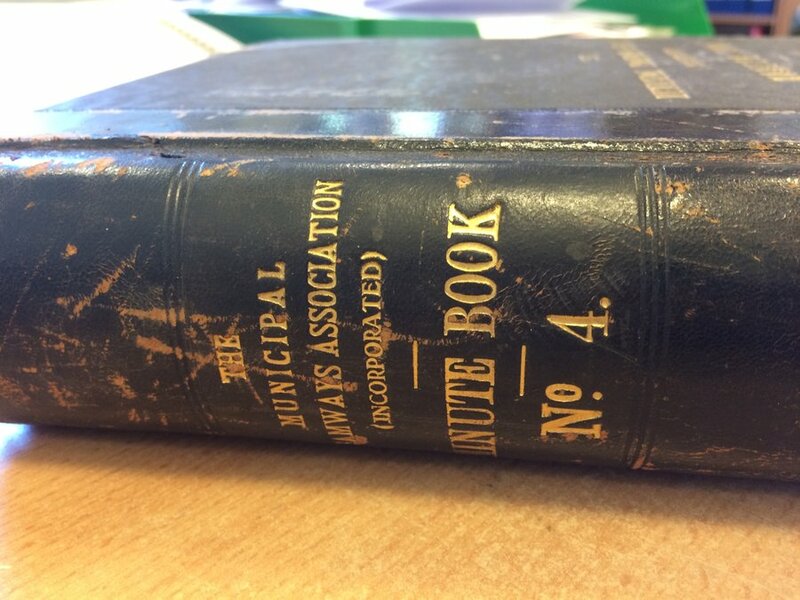 It was hoped that ‘gradually, as and when renewals take place’, mangers would see the wisdom of changing to a standard construction. The Sub-Committee concluded their Report by thanking the tramway general managers who had provided them with information and hospitality. They added that it was now up to the MTA’s Executive Council to approach the Engineering Standards Committee regarding their findings. The drawings have now been added to our already vast collection. They are listed on our online catalogue, and anyone interested in them can request an opportunity to study them – simply contact the Library through the online enquiry form on our website.